HEREWITH a message to all dubious parents who are still of the opinion that every hairy and strangely attired pop group - like the one on the left - is steeped in untold evils and definately not to be admired by your teenage son or daughter...it's time you changed your ideas ! For underneath the mass of hair that covers Jethro Tull, are four highly intelligent musicians, well educated, with as high a set of morals as you could wish for. Leader of the group is 22-year-old Ian Anderson, former grammar school boy and art student whose original intention, he supposes, was to become a teacher of mathematics. Outwardly a very serious person, he is now totally steeped in his music and continually excited by the technical discoveries it has to offer. He is more worried that he still cannot write music than that the group has been turned down by TV companies as "not suitable for family viewing." "But controversely we're all very pleased to be able to appear on programmes like 'Top Of The Pops.' It's all part of showbusiness, and we're part of showbusiness too. "There's really no logical reason why we should have our hair long and dress the way we do. "I grew my hair long simply because I like it better that way, and I dress the way I do because I feel comfortable - but if we all agreeable, there's no earthly reason why in six months time we couldn't all have short back and sides and be wearing suits! You don't have to have long hair to play 'progressive' music. In fact, if you dig at Ian you'll find the only facet of 20th century existence that really needles him in the thought of being a "pipe and slippers" man. "Of course I'll end up being one of those eventually, but I want to put the day off as long as possible." He formed Jethro Tull 18 months ago because "I couldn't think of anything else to do to avoid getting in a rut. I'd already taken three different courses at school and college in order not to become pigeon-holed, and the formation of the group just sort-of-happened. "At the time I couldn't play any instruments. I began learning the flute immediately, and I only learned how to play guitar six months ago." 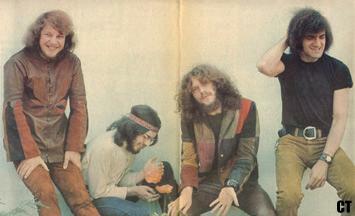 Jethro Tull started in a very conformist way, joining the blues boom and playing 12-bar blues simply to earn a living.
" But you can't go on playing that forever. The only reason for its popularity was its basic simplicity. Even the most unmusical person can understand the blues." "The blues thing played itself out, and all those groups with no ideas of their own have fallen by the wayside. Luckily we managed to come up with a few ideas - I somehow managed to start writing, and the end product is this hit single. "We're all very grateful for it, and we have no desire to pretend singles aren't important. We don't play them on stage simply because we can't reproduce them, not because we're ashamed of them as has been suggested. "In fact we're very much in favour of the show business tradition. Liberace, for instance is a tremendous entertainer, and if some enterprising person would stage a concert with him and, say the Nice and the Family, it would be an absolute sell-out, and all those underground supporters would go mad for him." Life to Ian is a compromise and it has to be. Working life is a compromise between him lying in bed all morning enjoying 20th century freedom and his managers Chris Wright and Terry Ellis organising business projects for six months hence. Composing life is a compromise between the flights of fancy that he wouldlike to be able to record, and his own technical limitations; and also a compromise between the sound effect he would like and the limitations of hiw fellow musicians in the band. He's never taken drugs and never been drunk and despises those who do. Ian confesses he is basically a very shy person - perhaps that's why he hides behind all those whiskers - and "I just allow the things inside me to come out in my music. If I jump about on stage, it's completely spontaneous and unplanned. "What will I be doing in ten years time? Who knows? I may be writing music for listening, or on the other hand I might be the compere at the London Palladium. But whatever happens will be the best thing for me. The whole of life is a process of thought - learning about what you can do, and learning how far you can stretch your capabilities. "And eventual understanding of what I'm doing is the one thing that gives me so much satisfaction I just want to jump about the room with joy. "In fact if ever I went to see a psychiatrist I'm sure he'd find me a prefectly normal healthy individual with no evil complexes or hidden streaks. "The one thing that does give me a kick about looking the way I do is when a spiky-headed big-booted bloke strops me in the street and shouts: -'Get yer 'air cut.' For some reason I find that highly amusing.